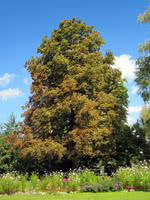 Bred by Jeffries Nurseries, the Skyfest is a fast growing, tall cottonwood with excellent disease resistance and adaptability to many kinds of soil. In the fall, its leaves turn a golden yellow. This species has an aggressive root system, making it unsuitable for planting close to buildings but very drought resistant and an excellent choice for shelterbelts.